1884-1890 autograph album that belonged to Annie May Stuff of Polo, Illinois, with some autographs collected after her marriage to George W. King. Many of the autographs were signed at Keuka, Florida. Annie's name appears on the first end paper, shown below; it's very faint. 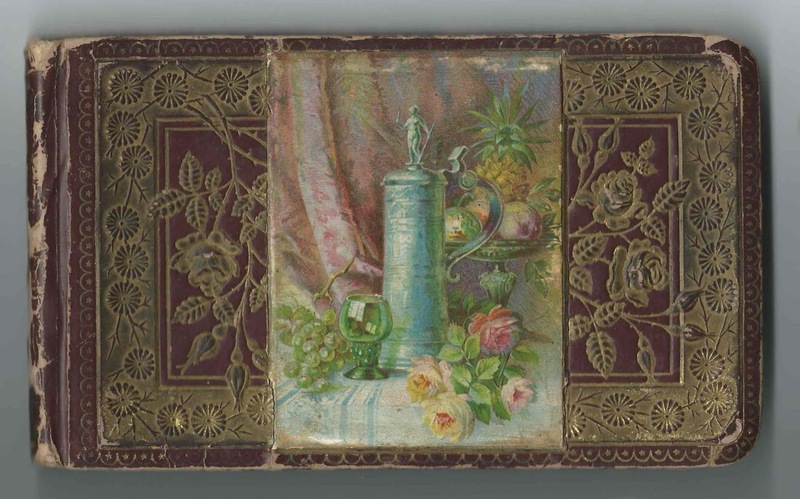 The album measures approximately 7-1/4" x 4-1/4" and contains the sentiments of 68 of Annie's relatives and friends. An alphabetical surname list and an alphabetical list of the signers, together with any personal information they offered, appear at the end of this post. Annie May Stuff was born on the 10th or the 17th of May 1868 at Polo, Illinois, the daughter of John Herbert Stuff and Lydia L. (Hershey) Stuff. She had, I believe, eight siblings. 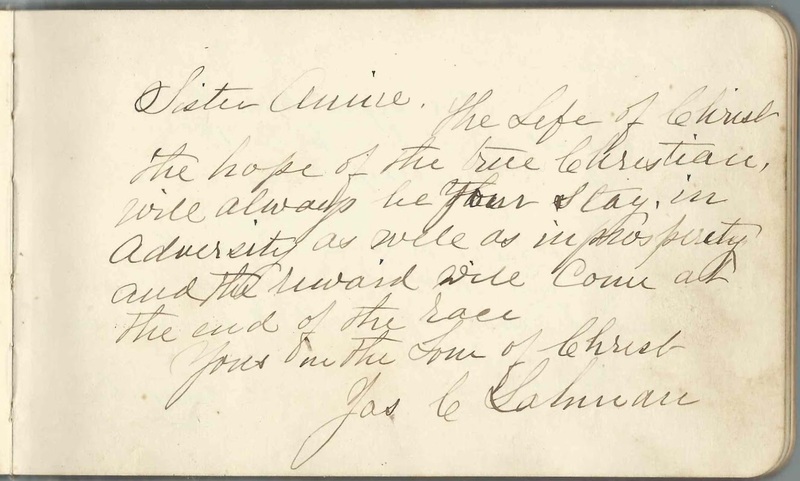 One signer, James C. Lahman, inscribed a page to "Sister Annie". I don't know whether he was a brother-in-law to Annie or her husband George W. King or was referring to a religious relationship. Annie's family were members of the Church of the Brethren. J. C. Layman was a minister in that order and would help build the community at Keuka, Florida. 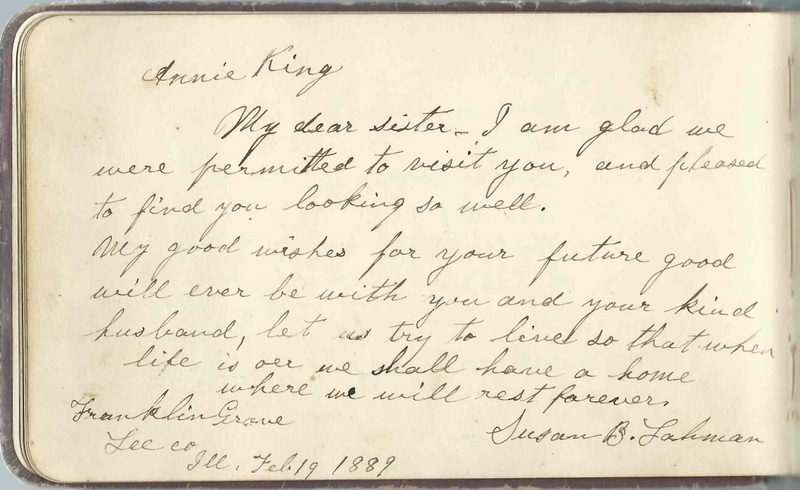 In case there is a family connection to the Lahman family, another signer by that name, Susan B. Lahman, inscribed a page at Franklin Grove, Illinois, on February 19, 1889. One especially touching page was inscribed by Annie's aunt, Lydia Alice (Stuff) Powell, on April 27, 1884. She was a sister to Annie's father John Herbert Stuff and was the wife of William Upton Powell. "Remember the Beautiful night you received this Book and the splendid sleighing. I don't think I ever will." Annie would name a daughter Alice, presumably in Aunt Alice's honor. Aunt and Uncle Susie and John Teeter, who signed at Mount Morris, Illinois, on April 30, 1884. They later lived at Keuka, Florida. Cousin Daniel L. Forney who signed at Polo, Illinois, on "5/11/1884"
It seems that the connection for the Stuff family of Polo, Illinois, and Keuka, Florida, had to do with the Church of the Brethren. In 1884, the Managing Editor of the "Messenger", Elder J. H. Moore of Mount Morris, Illinois, went to Florida to preach and determined that the climate might be beneficial for his wife, who was suffering from tuberculosis. Six months later, he was joined by Annie's uncle John Teeter and family. The community planted many orchards and prospered until the freeze of March 1895 delivered a terrible blow. Read more about the community at Keuka and Hawthorne here. "Don't forget the trip to the Oclawaha river"
On October 13, 1888 in Illinois, Annie May Stuff married George W. King. He may have been the son of Jacob and Linda Rodabaugh King, but I haven't found confirmation of that. George and Annie apparently moved to Florida at some point, as George died there in 1902, leaving a son George and a daughter Alice. On August 31, 1905, Annie married William L. Keefer, a Pennsylvania native, son of Joseph Lynn Keefer, Sr., and Christine (Luckenbach) Keefer. William and Annie had a daughter, Lucile S. Keefer, who, according to an unverified source, was adopted. Annie died at Phoenix, Arizona, in 1922. William lived until 1956. Annie's buried with her parents and other family members at the Pine Creek Brethren Cemetery at Pine Creek Township in Ogle County, Illinois. B Ingraham Ringer Z ? 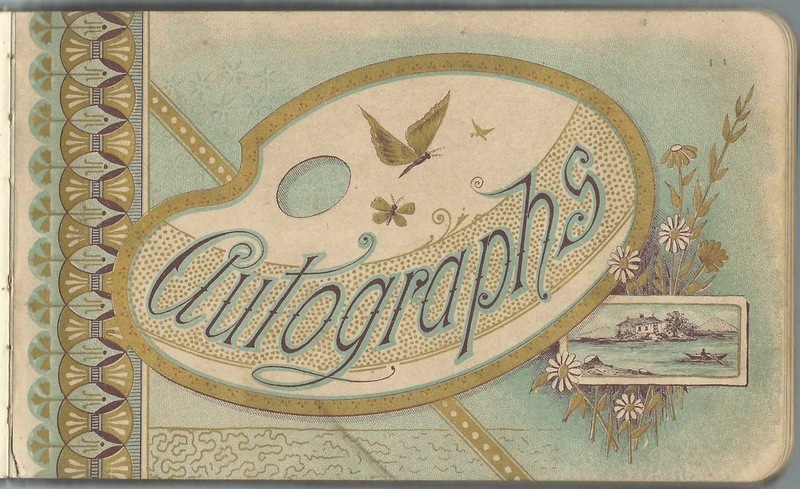 ?, signed on February 9, 1884 in Huntingdon County, Pennsylvania. Name might be Mide Pray or Mide Pray Warrors or Worroes or ? Olla Bomberger, signed on "4-6-84"
S. T. Bosserman of Dunkirk, Ohio, signed at Keuka, Florida, in 1885. Residence "Brightside"
Andrew W. Ingraham of Keuka, Florida, signed on May 4, 1885. 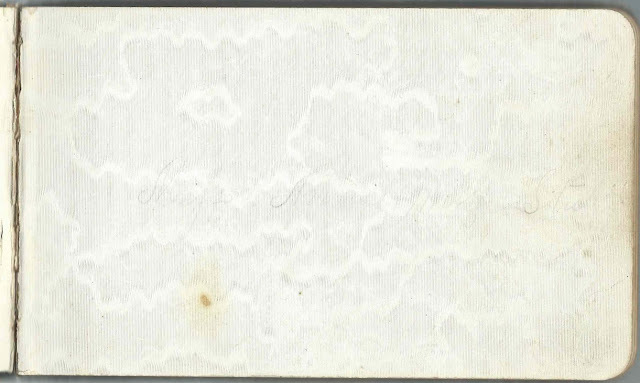 Mentions "old Fort Brooks"
James C. Lahman; inscribed to "Sister Annie"
G. A. Miller of Woosung, Illinois, signed on January 17, 1884; given name initial might be J.
? Morris, signed at Polo, Illinois, on April 27, 1884. First name might be Scott or Leott or ? Beele Pike, signed on February 7, 1884. Not sure of given name. Alice Powell, signed on April 27, 1884; Annie's aunt. "Remember the Beautiful night you received this Book and the splendid sleighing. I don't think I ever will." Presumably Lydia Alice (Stuff) Powell, sister of Annie's father John Herbert Stuff. Alice V. Price of Pine Creek, Illinois, signed at Keuka, Florida, on April 5, 1885. Also has the message: "Sally Jane ever remember your friend Aunt Betsy"
A. W. Price of Pine Creek, Illinois, signed at Keuka, Florida, on "4-5-85" "Don't forget the trip to the Oclawaha river"
Rosa Spickler, signed on "3-9-1884"
Emma Spickler of Polo, Illinois, signed on "2.9.1884"
Miss Annie May Stuff; album owner. During the time the autographs were collected, she married George W. King. Hettie Swank, signed on May 5, 1885 at Keuka, Florida, Residene Lake View. Not sure of latter place name. 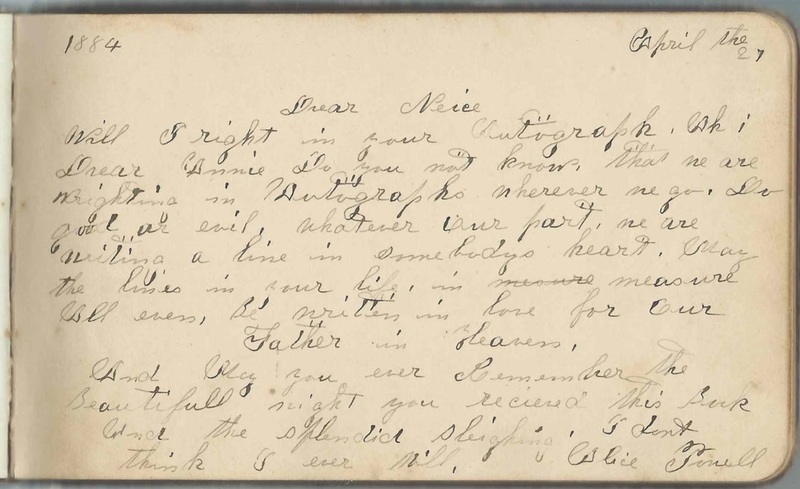 Susie and John Teeter, your Aunt and Uncle, signed at Mount Morris, Illinois, on April 30, 1884. They later lived at Keuka, Florida. Gracie Wolff, signed on May 18, 1884; Annie's schoolmate; her surname might have been Wolf or she might have been from a different family from Ella, Daniel and Emma.